Excel 2016: Features and Toolbars | Tutorials Tree: Learn Photoshop, Excel, Word, Powerpoint and Wordpress for free online. 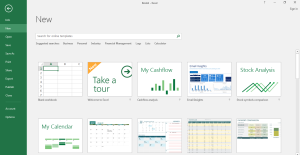 In addition to the Ribbon, MS Excel 2016 gives us the following basic features and toolbars. 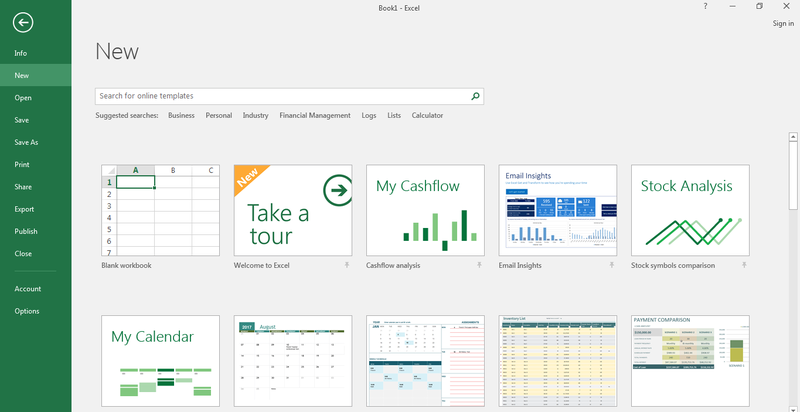 Microsoft Excel 2016 has a Quick Access Toolbar located on top of the screen. It contains major commands that you can use directly without having to go to the specific tab. It has Save, Undo and Redo as default options and you can add more options by clicking on the arrow (drop down) and selecting the options. You can select More commands and look for other commands not present in the list. On the Ribbon top, you will find an option ‘Tell me what you want to do’. This will help you in searching for different options or commands. You can directly type your query here and it will take you to the required options and you can select the command. This is the view that will provide you with different options for opening, saving, printing the worksheet. Info: It contains the options to protect, inspect and manage the workbook. You can see properties of the file here as well. New: You can create a new workbook for your work by selecting one of the given templates. You can also select a blank workbook. Recent: The recently opened and saved files are shown here. OneDrive: You can sign into the OneDrive that will help you to open your files anywhere and you can share it with others too. This PC: It gives you options to open files from different locations in your PC. Add a Place: You can add locations of Office365 SharePoint and OneDrive here to save your documents on the cloud. Browse: You can browse the locations on your system to select and open the files. Save and Save As: You can save the changes made to your files using these options. Other Options like Print, Share, Export, Publish etc. are also present. We will discuss these in later tutorials.